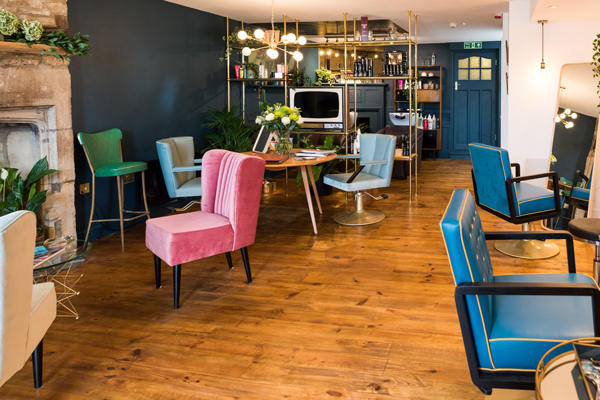 In a former coach inn, this Matthew Curtis salon is styled as a mid-century cocktail lounge with a touch of Mad Men glamour. 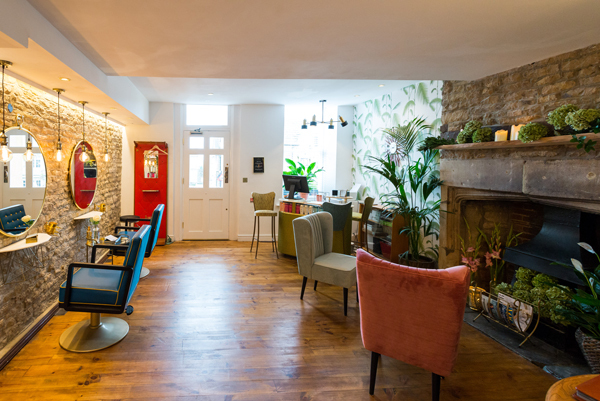 A cocktail reception bar complete with original 1950s bar and stools creates a grand entrance for when guests first enter Matthew Curtis’ Cotswolds salon. In the waiting area two velvet cocktail chairs face a stone fireplace. On the walls, 1950s inspired palm leaf paper amps up the glamour. A round Ercol table, bespoke brass room divider shelving and retro TV set all add a vintage touch to the space. 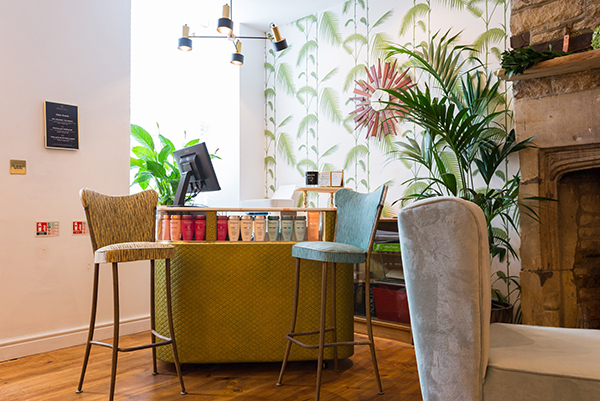 “It only took four weeks to refurbish the premises,” explains salon owner Matthew Curtis. The building was a barbershop (without a boiler) before the transformation and originally it was a coaching inn so the aim was to keep elements of its history alive. 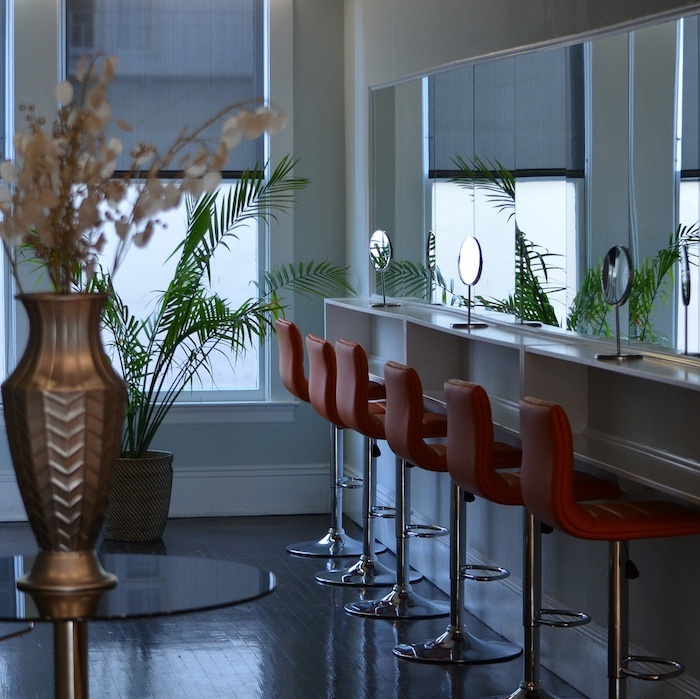 “I’ve worked with designer Judy Reaves for all of my salons. 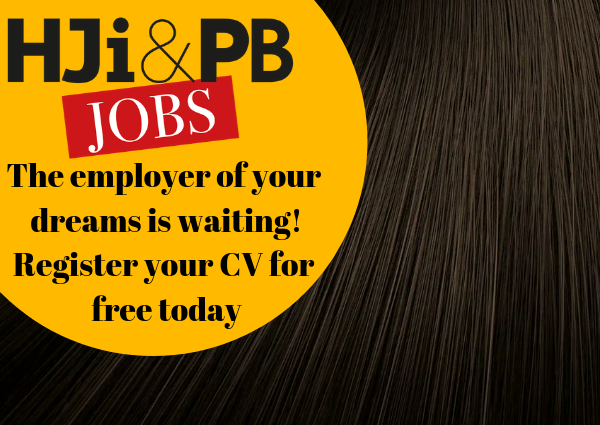 She has a theatre design background which really comes across in her work,” he adds. 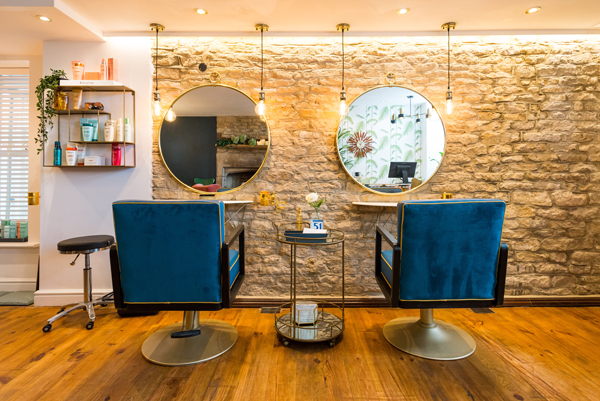 The beautiful Cotswold stone takes centre stage at the front of the salon with a deep blue wall at the rear. 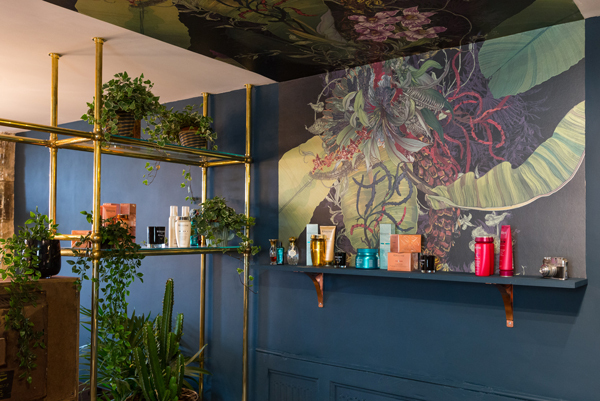 There is a combination of wallpaper and paint in hard-wearing Mylands Marble Matt emulsion, which is extremely practical for a salon as it can be scrubbed clean. 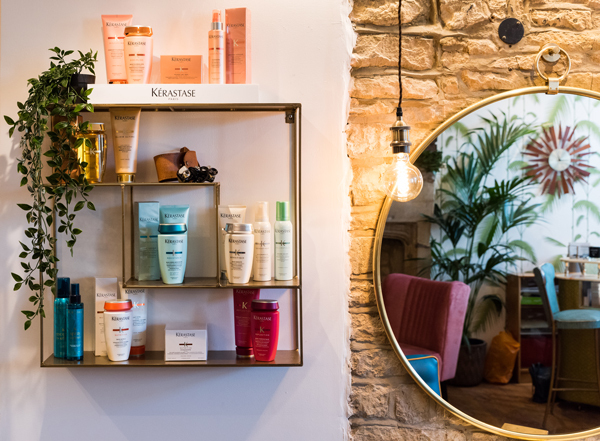 Overhead spots at each station give stylists true to life colour recognition, while filament lamp pendants hang at eye level by the mirrors to give an attractive glow to a client’s face. The existing floorboards have been sanded and stained to reveal a mid-oak satin finish. 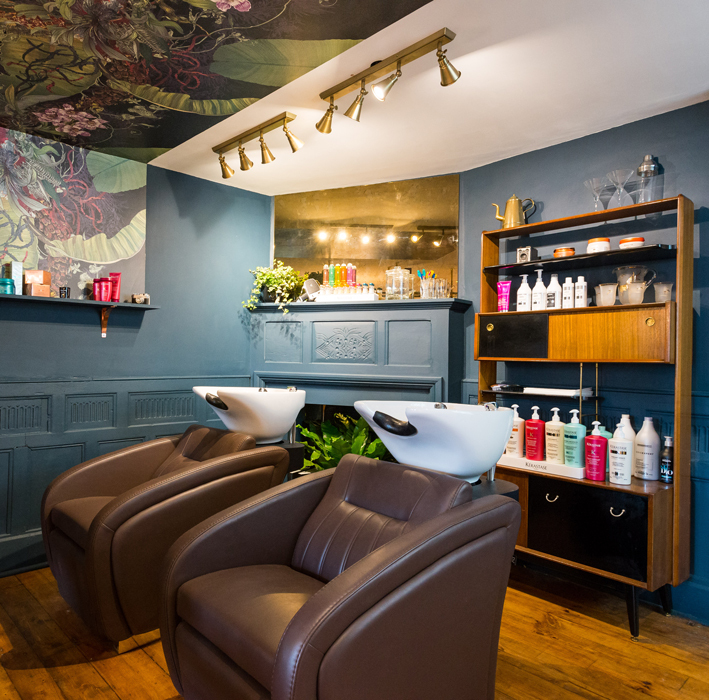 The backwash area is designed to be a relaxing space with less lighting. It also has an original fireplace and feature panelling that was discovered halfway through the renovation. 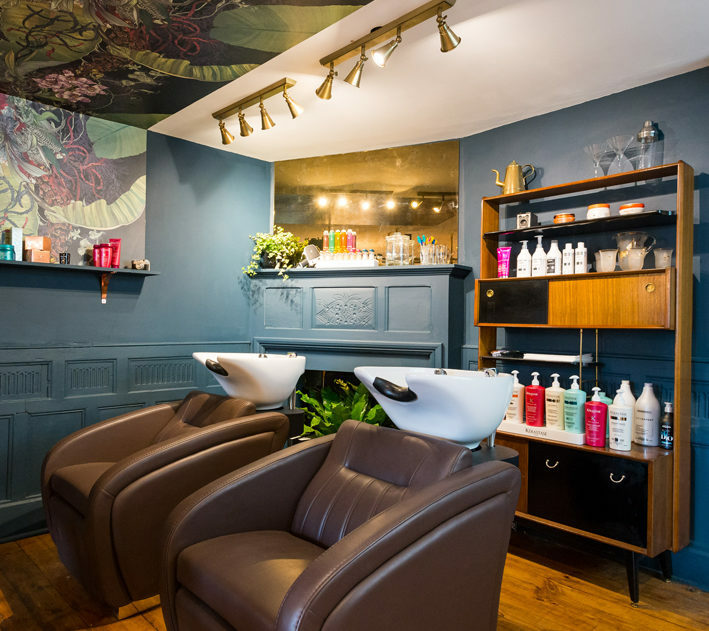 Design studio Timorous Beasties created a panel of a tropical print panel for clients to gaze at while having their hair washed. 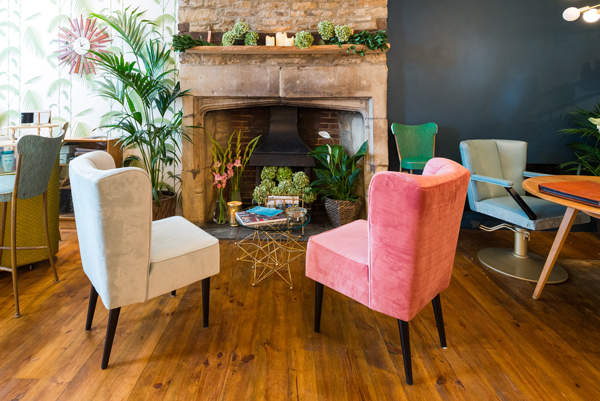 Clients can enjoy sitting in one of two types of styling chair, which are both inspired by 1950s furniture design. Three chairs feature a square button-backed style and two chairs boast a curved cocktail-style. There’s a combination of hard-wearing coloured vinyl and tactile but super-resistant velvets. There’s a touch of luxury to the soft furnishings but everything is still practical. • Allow extra time. We lost time in the build schedule when we discovered the panelling and fireplace, but it was worth it. • Always consider the path that both clients and staff will follow through the salon as everything has to be practical. 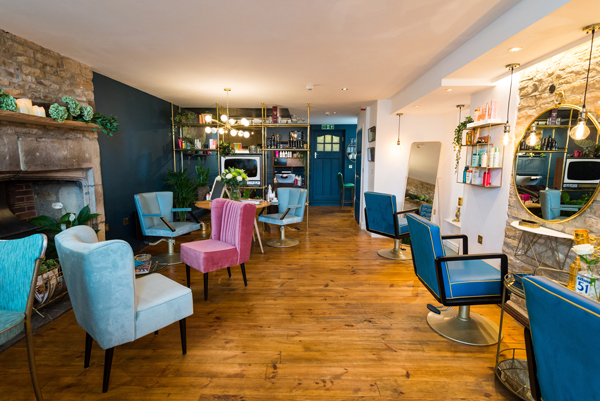 • Create instantly recognisable branding, for example, we use the same deep blue colour in all four of our salons. Mid-century style lighting and furniture. Another view of the salon.